Home / 3D DIY stuff / xBot Medium – A new printer is baking! Previous post: Duet WiFi – Activate and connect the WiFi… when it doesn’t work! Cool your next project is coming at the right time. Based on your Ultimaker threat , I have built the U2ext+ and it works really fine. Thanks for your impressions so far. Maybe you should mention in your previous posts, that the current sense resistors have to be changed on the um 2.1.4 mainboard, because of loosing tourge on your steppers. I am speaking about the ultimaker 2.1.4 mainboard from china. In these boards the current sense resistors usually have 0,5 ohm, but if you check the schematics on github, you will see, that they have to be 0,05. These resistors say the driver how much current flows to the stepper and limit the current. So, if you use steppers with a higher current amount you will loose tourge. If you want I can send you a link to the um forum, because this doesn‘t belongs dierectly to your project. Ok. Guess it depends on the manufacturer from whom you buy it. I’ve had several different boards at my desk from China. They all functioned just fine with no lack in torque, so if something was up, it didn’t impede the function to any noticeable degree. There are lots of “fun facts” circulating around and I’ve learned to ignore it all unless or untill I start having problems and go looking for solutions. What do you think about a new and maybe better print surface? Neoceram is a Ceramic infused glass, designed to withstand up to 800C heat impact. Why it can do that? That’s one of the interesting things. The Neoceram glass doesn’t ‘Expand’ when it heats up, it doesn’t change of shape when heating up, so it doesn’t break, chip, or get damaged by heating/cooling. There are so many surfaces around it’s enough to make anyone dizzy. I see this again as one of those inventions solving a problem that isn’t there.. or at least not one that causes problems really. Your post seem dangerously close to an advertisement. Might you be affiliated with them Oliver? Ultimaker is using some sort of hardened Borosilicat glass and they just don’t chip, while many chinese manufactured plates are indeed somewhat fragile. I’m using PEI-Coated aluminium plate in my machines and just listed it as one of my material components for the Xbot printer as well. They don’t break, chip or otherwise gets ruined. I have 500W AC heater under it, so it heats rapidly and I can use a smaller PSU than otherwise + not so much current through my electroncis as when using DC bed. I’m also sometimes using glass with glue on, when printing Nylon. For glass I just use some old glass from a Printer/scanner. Some people use mirrors as well. What I’m trying to say is: I’d never use a ton of money on a custom surface that can break or wear down. Also goes for all the various surfaces you can put on your bed as it just makes up for a running expense. I used PEI sheets some years ago, and they are nice.. but at some point they do break/tear if you make a mishap, so it’s very expensive in the end. As a rule: if it’s advertised primarily on youtube, then I ignore it. I want to read and see tests. 🙂 Guess I’m old that way.. liking datasheets and such, hehe. I don‘t affilate with them. 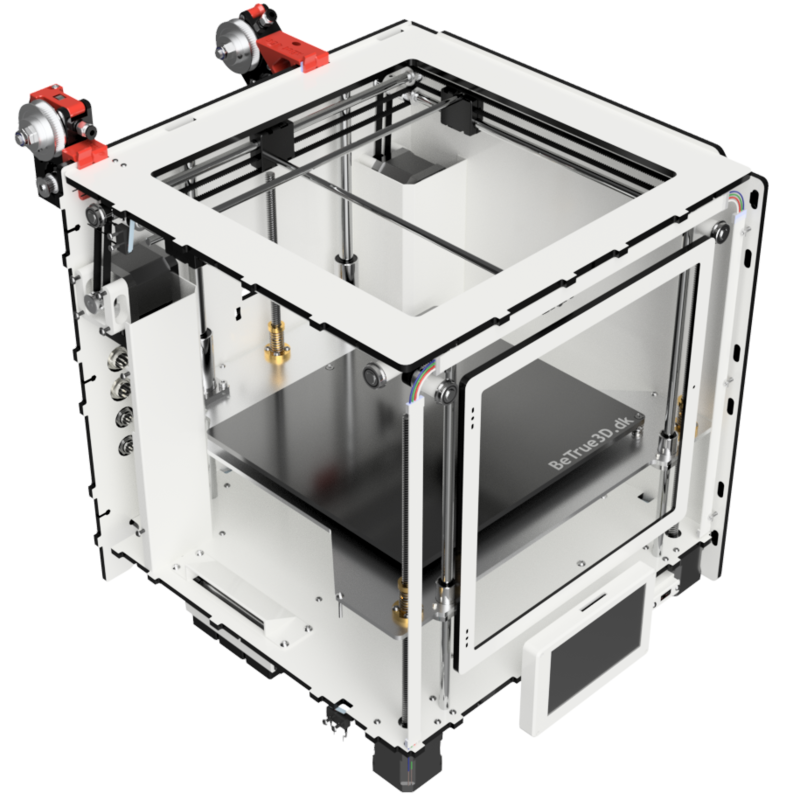 I found this post on an ultimaker forum, where they want to improve the ultimakers l8ke you. For me PEI is good enough, but you are creating a new printer and this is maybe a good way to test / improve it with this new surface. If you are interested in sheets I can send you some links. Thanks, but I don’t want to use sheets. Keeping the running expenses down by finding permanent solutions. I’m using a pei-coated aluminium plate for my printer. When I need a different surface I clamp on a plate of glass or similar. Could you give a link to your PEI coated plate? I’m wanting to build a direct drive IDEX system based on a Duet wifi. I’m really struggling to find designs at the moment. You say you can add up to 4 extruders on this. Have I completely misunderstood it, or does this mean we could use your design for an IDEX system? I know you have your own extruder design, but I want to print really really soft filaments (like 60A if I can) so I want a direct drive, unless I went with zesty or something. I love the independent z levelling on this. I like your spec too. Is there a reason you didn’t want to go down the rail route? I’m just a bit concerned about all the weight for my direct drives! Hello Kester and thank you. I’m not sure what an IDEX system is? The xBot can have multiple extruders mounted, but to be fair, you can mount a lot of extruders on many printes. If nothing else, just by drilling some holes. It’s due to the controller combination I can use as many. If I Duex2 it would make 2 extruders possible where as Duex5 would give me up to 3 more. What I’m trying to say is that you could do this on most printers as long as you invested in the Duet WiFi (or ethernet) and Duex5. I use 2x 1.75mm filament through the same hotend and change over to 3mm sometimes. I _could_ settle for Duex2, but it would require a good deal of fiddling every time I switched over then. You are right to be aiming at using a Direct Extruder when using filament that soft. You CAN do it in 3mm bowden but Direct is best for optiomal result. The stuff I print is 85A. 1) I don’t have any experience in using it, so hard to design something nice with it. 2) The CrossBot Gantry setup here is just awesome as there is zero skew at any point, making perfect circles etc. 3) This project was a matter of making something very similar to the Ultimaker2 machines, as people can relate to that design. Ie: people can compare and judge the design and price. Mine has same print area, but has 2 extra motors for true autolevel and is only 1cm deeper and 2.6cm wider.. and much lower due to extruder placement, so seems a bit silly to me that Ultimaker hasn’t done it in their UM3 instead of fancy features. About weight and Direct drive in this setup. If you put in more than one toolhead in this design you are going to be sacrificing some printarea. Many thanks for such a detailed reply! IDEX is usually just two independent extruders (e.g. BCN3D Sigma, or LeapFrog), as opposed to having two extruders attached to the same X gantry holder (e.g. Vertex K4800, Flashforge Pro and many others), or two filament feeds going to the same hot end (e.g. diamond hot end). IMHO, IDEX is the only sensible way to print mixed materials with different temperatures settings. And direct drive IDEX can also give the option of using flexibles with harder filaments, like PETG. I already have an Ultimaker style printer (the aforementioned Vertex), but it’s a dual head Bowden, and therefore not much use! If I convert this one to IDEX, the print area would be very small, as you say. So I really need a new box with plenty of space down the sides. I’ve had a look at some magnetic switched hot ends, and the flex3drive. But the latter doesn’t respond to emails and some of the stuff on the website looks ‘untouched’ for several years. There seems to have been some dispute with Nimble Zesty which is a licensed version of the same thing and I’m not sure if the hassle with the geared steppers and firmware changes is worth it. I was thinking of getting a couple of titan aeros. I know they’re really noisy, but they also seem to be ‘no hassle’ in terms of setting up with the Duet Wifi for IDEX. I do like the idea of your bed levelling, in fact I like it all. What do think the print size would be if I tried to make it with two independent titan aeros? Sigh, it’s a fun hobby but I don’t have the time to do full designs and also build them up! Diamond is “just” a mixing hotend intended to use with x-times the same type of material with same melting point. Titan isn’t particularily noisy. It’s just like any other geared non-belted extruder, and they work very nicely. About flex3drive and nimble, yea, Nimble borrowed stuff from flex3drive to test but ended up copying it instead. Or rather, downgrading it, but advertising it as being superior which it simply isn’t. I’ve talked to them and asked about their buzzwords and they simply just couldn’t quantify why it was better or strong etc. I wouldn’t know about print size as I havn’t looked into any of these solution at all aside from a curiosity perspective. I’d guess it would at least 5cm on one or both axes, but that’s just a guess.